Ten years after Revenge of the Sith and 32 years after Return of the Jedi, the wait is finally over for Star Wars fans as Disney's Star Wars: The Force Awakens makes its debut in theatres this weekend. Record-breaking pre-sales, online activity levels, and traditional pre-release tracking all suggest that anticipation levels for the film are simply off the charts. Given its reported pre-sales (of $50 million to $60 million for opening weekend alone), there is no doubt that Star Wars: The Force Awakens will absolutely demolish the current all-time December opening weekend record of $84.6 million held by 2012's The Hobbit: An Unexpected Journey. Whether the film can ultimately top the $208.8 million debut of this year's Jurassic World to set a new all-time opening weekend record does remain to be seen, but based on all of the various signs, BoxOffice feels increasingly confident that Star Wars: The Force Awakens will indeed establish a new all-time opening weekend record this weekend. With Star Wars: The Force Awakens set to dominate, it will be tough for both Fox's Alvin and the Chipmunks: The Road Chip and Universal's Sisters to find enough moviegoers to make an impact this weekend as the two films battle it out for a very distant second place. However, BoxOffice does expect both films to hold up very well after this weekend with the aid of the holiday season. - Highly anticipated franchise relaunches have the ability to break out at the box office, as witnessed by the mentioned $208.8 million debut and $652.2 million total domestic gross of Jurassic World earlier this year. And without adjusting for ticket price inflation, 1999's The Phantom Menace grossed $431.1 million in its initial domestic run (which adjusts to $710.5 million with today's ticket prices). - In serving as a sequel to the original Star Wars trilogy (as opposed to a prequel), which features Harrison Ford, Mark Hamill and Carrie Fisher, excitement for The Force Awakens feels even higher than it was before the release of The Phantom Menace. - Pre-release excitement for The Force Awakens has been furthered by a marketing campaign that has been seemingly everywhere. As was the case with 2012's Marvel's The Avengers, Disney's marketing may very well succeed in expanding the pre-established Star Wars fanbase. 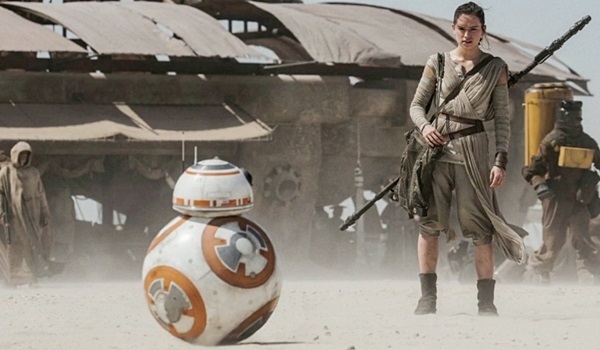 - Advance ticket sales for The Force Awakens on Fandango and MovieTickets have been tremendous. The film has now become Fandango's top advance seller of all-time. The film's massive pre-sales suggest that the Thursday night start for The Force Awakens will be significantly stronger than that of Jurassic World. - Online activity for the film has been through the roof. In the days leading up to its release, The Force Awakens has been generating more than twice as many tweets as Jurassic World and Avengers: Age of Ultron combined, at the same point in their respective cycles earlier this year. - The film will be launching in a marketplace with plenty of room, thanks in part to a number of high-profile wide releases performing softer than expected since mid-October. - If all that wasn't enough, the film now also boasts a 94 percent Tomatometer on Rotten Tomatoes. - The December release date. Without adjusting for ticket price inflation, no film has ever opened to $100 million in the month of December (the $72.6 million debut of 2003's The Return of the King does adjust to $100.5 million when taking into account ticket price inflation). Even with the immense anticipation levels for The Force Awakens, it is still possible that the film's opening weekend performance could be somewhat deflated by the pre-Christmas December launch. - The lackluster overall legacy of the prequel trilogy could still keep some older fans of the series away, though this will likely only be a minor factor with The Force Awakens representing a return to the series' roots and ten years having passed since Revenge of the Sith (which was also the best received film of the prequel trilogy). - Though it fell off significantly from each of its two predecessors, 2011's Alvin and the Chipmunks: Chipwrecked still managed to open with $23.2 million and gross $133.1 million in total domestically. - With The Peanuts Movie and The Good Dinosaur both having under-performed, there is more room for The Road Chip in the holiday marketplace. - The film could benefit a bit from serving as an alternative to The Force Awakens for families with younger children. - In this weekend's battle for second place, The Road Chip will have the location count advantage over Sisters. - Opening against The Force Awakens and the weekend before Christmas are sure to deflate the film's opening weekend potential. - While the franchise has always been critic proof in the past, a fourth film may just prove to be one film too many for this franchise. - On Twitter the film is currently performing softer than last year's Night at the Museum: Secret of the Tomb was in the days leading up to its release. - The re-teaming of Tina Fey and Amy Poehler on the big screen. The duo's previous theatrical effort together, 2008's Baby Mama, opened with $17.4 million and went on to gross $60.5 million domestically. - Many of this year's holiday alternatives to The Force Awakens will likely skew towards male moviegoers. Sisters should be an exception, which could prove to be an advantage for it going forward (especially given the poorer than expected early reviews for Joy). - Early reviews for the film have been very good so far. The film currently has a 78 percent Tomatometer on Rotten Tomatoes. - Sisters hasn't been lighting Twitter on fire, though the film's generic title could be having a negative effect on its Twitter activity levels. - As was recently the case with The Night Before, there could be a disconnect between the film's healthy critical reviews and the overall reaction among moviegoers to the film's trailers and marketing. Thanks to the strength of Star Wars: The Force Awakens, BoxOffice projects this weekend's top ten films will total $282.5. That would represent a new record for the largest unadjusted top ten total ever; topping the Jurassic World led $266.0 million top ten total of June 12 - 14 earlier this year. This weekend's projected performance would represent an exceptional 131 percent increase over the $122.1 million top ten total for the same weekend last year, which was led by the $54.7 million debut of Warner's The Hobbit: The Battle of the Five Armies and also saw Fox's Night at the Museum: Secret of the Tomb start out with $17.1 million and Sony's Annie start with $15.9 million.